We all know the terrifying statistics: a million species extinct by 2050, 19 of the 20 hottest years on record since 1980, Greenland and Antarctica melting, droughts, floods, famines . the G8 have had over 30 years to address climate change and only succeeded in providing trillions in subsidies to the very industries that are destroying our planet and our future. And while the G8 continues to line their pockets, island states disappear and hundreds of thousands die as a result of the freak weather conditions caused by their irrational and uncontrollable obsession with never ending economic growth. We have a ten-year window to act. As the megalomaniac G8 leaders meet in Germany, masked behind a barrier of fences and soldiers, intent on leading us further towards catastrophic and irreversible climate chaos, we must shout, scream and roar Ã¢â‚¬Ëœno more’. Now is the time to take direct action and shut them down, them and their climate criminal industry friends! The 8th of June International Day of Action Against Climate Change and the G8 has been called by the International Rising Tide Network. This is a call for autonomous, decentralised actions appropriate for your town, city, or local area. Use this international day of action to support local struggles against oil refineries, gas pipelines, strip mines and coal-fired power plants. Disrupt the financial backers of the fossil fuel industry. Organise workshops to spread sustainable post-petroleum living skills. Find a weak point in the infrastructure of resource exploitation and throw a literal or symbolic wrench in the works. It’s time to visit your local polluters and give ’em hell! sup>We already know of actions planned across the UK, North America, Germany, Canada and Australia and that’s just the start! By 8th June actions will be planned around the world. Pass this call out on to all environmental justice, climate action, radical sustainability and related movements in all the G8 countries and the Global South. Rising Tide will create a collection of outreach and agit-prop materials (including this call out in five different languages) that can be used by groups around the world to organise locally. These materials will be downloadable from http://risingtide.org.uk and http://risingtidenorthamerica.org. Direct action and civil disobedience are the rational response in this time of crisis. 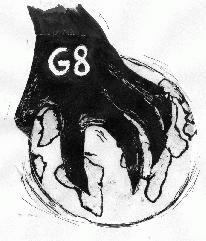 Support the 8th of June International Day of Direct Action against Climate Change and the G8! Tell us about planned actions for climate justice being planned in your community. Contact us – info@risingtide.org.uk and contact@risingtidenorthamerica.org In June 2007 the G8 will understand the meaning of rebellion, revolt and revolution. Their recipe for catastrophe will be met with our global resistance!